I tried a lot of classic recipes for this dish before hitting on just the right combination to make the magic happen. This makes a lot, but it gets even better with time so plan on leftovers. You can cut the recipe in half or cook the veggies in batches if your pan is not big enough. Something magical happens when the ingredients for a ratatouille meld, proving once again that the whole is more than the sum of its parts. Cut eggplants and zucchini into 1/2- x 1/2- x 2-inch sticks. Cut green pepper into 1/2- x 2-inch strips. Cut each tomato into 6 wedges. In a large skillet, heat 3 tablespoons fat or oil on medium heat. Saute onion until golden. Add tomatoes and turn gently until heated through. Transfer onion and tomatoes to a large plate. 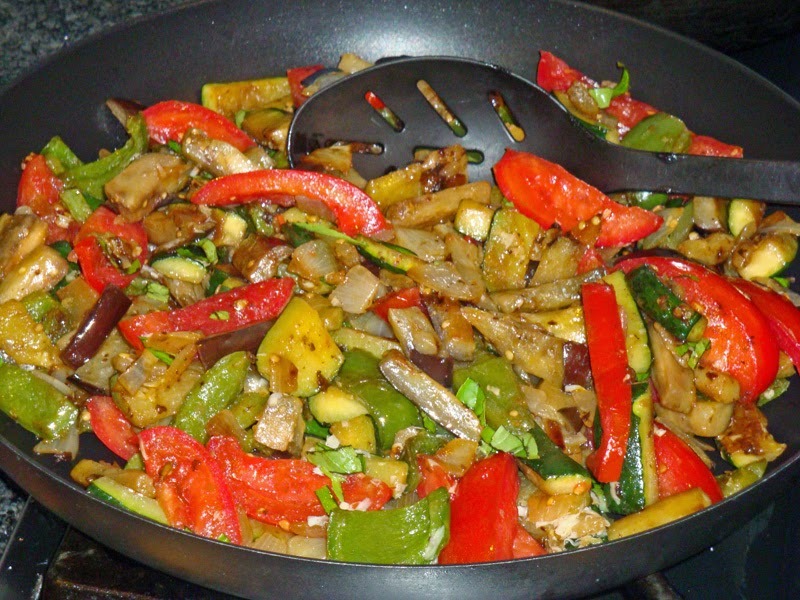 Heat remaining fat in same skillet and saute eggplant, zucchini, and pepper until softened, about 5 to 10 minutes. Transfer to dish with onions and tomatoes. Add garlic and basil to skillet, stir, and then return remaining vegetables back to pan for a minute or two until heated through. Add salt and pepper, stir, and place ratatouille on serving plate. Top with Gruyere cheese. Let cool or serve warm. Makes 6 large servings or 8 smaller ones. Per each of 6 servings: Calories: 203; Protein: 4.8g; Fat: 16.8g; Fiber; 4.1; Carbs 10.4g; Net Carbs: 6.3g. Recipe adapted from The Auberge of the Flowering Hearth by Roy Andres De Groot, 1996. Onion, Pepper, Tomato, Vegetable Stew, Zucchini. Bookmark. Could you add chicken to this? That would be tasty, Dianne Wood! So would ham, sausage, or bacon–yum, especially bacon!